What Regular Food Can Be Eaten on a Medifast Diet? If you need to lose a lot of weight, you may be considering Medifast because it is designed for weight loss at 2 to 5 lbs. per week. The majority of your food on Medifast comes from prepared Medifast meals and snacks, but it is important to know what other foods you will need to eat on the diet. To stay as healthy as possible, consult your doctor before starting any diet for weight loss. Each day on the Medifast Five and One Plan includes Medifast meals that you order, and one Lean and Green meal that you prepare. Medifast meals include brownies, shakes, oatmeal, puddings and hot beverages, and you can have five per day. Medifast's Transition Plan is an 8- to 16-week plan to help you maintain your weight loss once you reach your goal weight, and it helps you to gradually reduce Medifast foods as you add in a variety of regular foods such as fruits and low-fat dairy products. 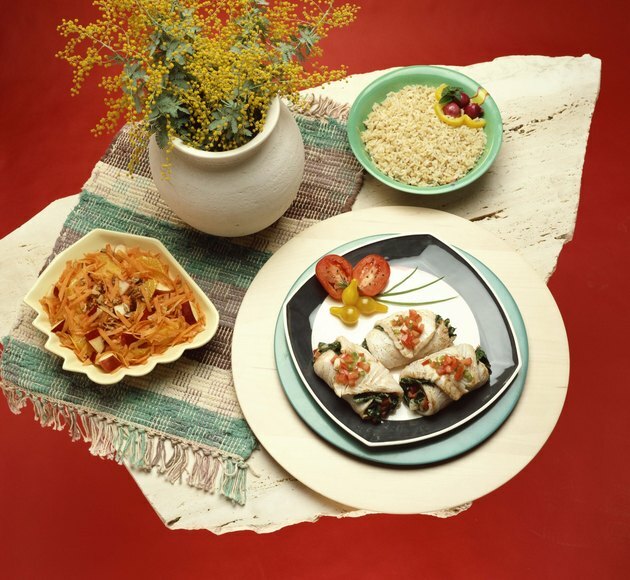 The Lean and Green meal is your single daily meal from regular foods on Medifast. You choose any three servings of vegetables from a list that Medifast provides, and examples of a single serving are 1 cup of lettuce or raw spinach, or one-half cup of raw sprouts or jicama, or of cooked asparagus, zucchini, broccoli or turnips. You can have 5 to 7 oz. of lean protein from fish, chicken, eggs, pork or ground turkey. Each meal should have zero to two servings of healthy fats, such as walnut oil, salad dressing or flaxseed oil. You can have up to three servings of condiments and seasonings each day from the approved list. Possibilities include one-quarter to one-half teaspoon of dried herbs or spices, 1 teaspoon of soy sauce, one-half teaspoon of barbecue sauce and 1 tablespoon of chopped onions, soy milk or fresh herbs. A daily snack is also optional, and you can have 3 celery stalks, 1 tablespoon of peanut butter, one-half oz. of nuts, a sugar-free Popsicle or sugar-free gum. Adequate fluid intake can decrease your hunger and reduce the risk of constipation, and Medifast recommends at least eight 8-oz. glasses of water each day. You can have other low-calorie or calorie-free beverages, such as tea, coffee and sugar-free soft drinks or drink mixes. The program states that you should not have more than 300 mg caffeine per day, or the amount in 3 servings of coffee. Also, avoid alcohol while you are on Medifast because it contributes calories and increases your hunger.